For more information and a detailed list of plants hummingbirds like, go to the Washington Department of Fish and Wildlife website at wdfw.wa.gov/wlm/backyard/ hummingbirds.htm. Sometime in the next week or so I expect to hear the distinctive buzz of hummingbirds as they return for the summer. It’s time to hang out the feeders. The males will be arriving first to stake out their territory, scout out food sources and get ready for the females to show up a week or so later. Once both are here we will be treated to a series of wild courtship flights as the males try to impress potential mates. They will find nest sites in shrubby bushes to raise their young. The most common hummingbirds we see in Eastern Washington are the rufous and calliope, with an occasional black-chinned hummingbird. Once a pair of birds has established themselves in your garden, their offspring will return every year. For their size, about the weight of a nickel, hummingbirds are big eaters. It takes a lot of energy to beat their wings 200 times a second as they fly at an average speed of about 27 mph, 40 if they want to hustle. They eat half their body weight in nectar and insects and eight times their weight in water every day. 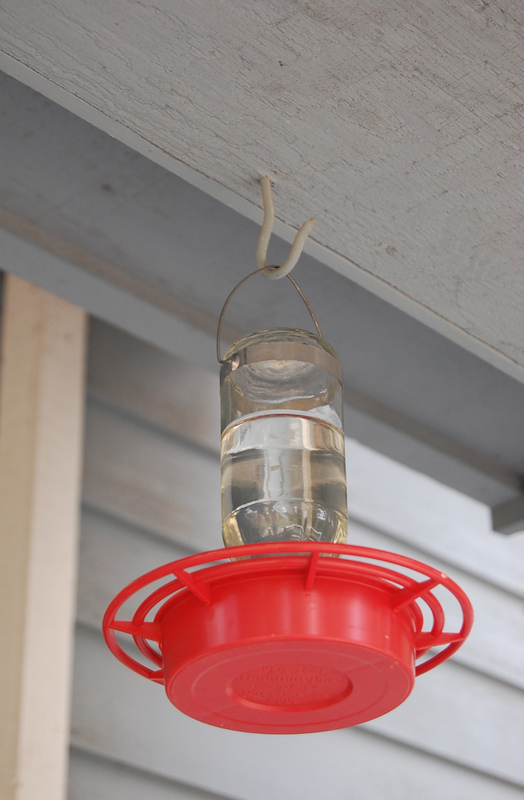 Hummingbird feeders are usually glass or plastic bottles fitted with red plastic feeding tubes or a sipping platform. Red is the hummingbirds’ favorite color and they will seek it out. Look for the feeders at most home and garden stores. Hang feeders where you can watch them but out of the direct sun or the easy reach of cats. Mine are hung under the eve of our front porch. Making hummingbird nectar is simple. Mix four parts water to one part white table sugar and boil the mixture for a few minutes to dissolve the sugar and sterilize the mix. Store excess in the refrigerator for up to three weeks. Don’t use brown sugar, honey or artificial sweeteners as the birds need the pure sucrose found in white sugar. Do not add red food coloring and skip buying commercial nectar mixes with coloring in them. The dye can be harmful to the birds. Change nectar every week in cooler weather and every four to five days in the hot summer weather to keep it fresh. To encourage them to stick around, make your yard a good place to stay. Plant brushy, shrubby bushes, small trees and dense evergreens of any type around your property to provide nesting and roosting spots. The female hummingbird will build her golf-ball-size nest out of moss, lichens and sculpted plant parts all held together with spider webs in the lower branches of these bushes. Plant a variety of flowering plants that bloom at different times through the season to provide more sources of nectar. Don’t be too zealous with insecticides; hummingbirds will eat great quantities of insects as a protein source. Master Gardener Pat Munts can be reached by e-mail at pat@inland nwgardening.com.